Take a medium-sized mixing bowl out and mix the lime gelatin mix and 1/3 cup of the sugar together. Pour 1 cup of boiling water into the bowl, constantly stirring for 2 minutes until everything’s dissolved. Measure out ½ cup of the cold water and add enough ice into it to now measure ¾ cup. Add the icy water to the lime gelatin mix, stirring until all of the ice has melted. Place in the fridge for 25 minutes. Repeat step 1 using strawberry gelatin mix but omitting the fridge step and instead pour mix into 16 (3-oz.) paper cups (we ended up pouring a little bit more than 2 tablespoons of the strawberry mix into each cup). Freeze the cups for 20 minutes*. Put ½ tsp. of the chocolate chips into the strawberry gelatin (it seemed like way too many chips for us so we cut down on the amount of chocolate chips we put in ours). Take a medium-sized bowl out and using a hand-mixer, beat the cream cheese and remaining sugar together until well blended. Stir in the COOL WHIP** and spread over the strawberry gelatin (for us that equaled out to 4 teaspoons of cream cheese mixture per cup). Pour the lime gelatin over the cream cheese mixture and insert wooden pop sticks into the center of the cup. Place in the freezer for 3 hours or until the pop is firm. Take the pops out of the cups right before serving. *They said 20 minutes but when we pulled them out they were almost completely frozen ! It was hard to get the chocolate chips in there. Maybe our freezer was colder than theirs was but next time we make this we’ll check on them after 15 minutes. If the JELL-O mixture had been looser, we probably would’ve seen the chocolate chips toward the outside of the strawberry mixture. **We were afraid that by the time we got the Cool Whip stirred in that it would break so we used the hand mixer for maybe a few seconds or so to get it blended. The strawberry and lime work really well together and it’s nice having that cream cheese mixture in the middle. As the pop firms up the chocolate chips disappear which makes it a tasty surprise when you bite into this ! The chocolate chips also add a different texture to the treat. We think everybody (but kids especially) will enjoy this frozen treat ! We weren’t paid in any form to promote JELL-O, Philadelphia cream cheese or Cool Whip. Take a medium-sized saucepan out and pour the water into it, turning the heat up high enough for boiling to occur. Once the water’s boiling, add in the rice and salt, putting a lid on the saucepan afterwards. Turn the heat down so it’s just at a simmer and let the rice cook for 16 to 18 minutes or until the water’s absorbed and the rice is tender. While the rice is cooking, get your blender and take the lid off of it. Add the cilantro, lime juice, oil, garlic, and the 2 tablespoons of water into the blender. Put the lid back on the blender and blend until the cilantro mixture’s smooth. 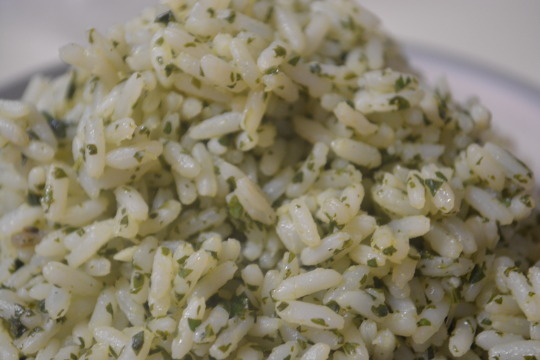 Once the rice is cooked, stir the smooth cilantro mixture into it, fluffing the rice with a fork. We took a bite of this and it didn’t seem to pop with flavor so we added some more salt and we could really taste the lime and cilantro afterwards.